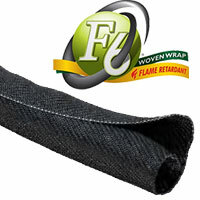 F6 Woven Wrap FR (F6V) is a VW-1 Rated version Techflex's industry recognized F6 Woven Wrap, with the added advantage of a flame inhibitor to provide an extra level of safety. It utilizes many of the same characteristics as Techflex original F6 split braided sleeving including the easy wrap around design and the extra overlap to ensure complete protection of important electronic communication and power systems. The combination of flame retardance, ease of installation, and complete coverage makes F6 Woven FR an ideal solution for many commerical and aerospace applications. Flexo F6 Wpven FR is available in Black with a White tracer identifying it as flame retardant.